John 6:32 Then Yesu said unto them, Verily, verily, I say unto you, Moses gave you not that bread from heaven; but my Father giveth you the true bread from heaven. John 6:35 And Yesu said unto them, I am the bread of life: he that cometh to me shall never hunger; and he that believeth on me shall never thirst. John 6:42 And they said, Is not this Yesu, the son of Joseph, whose father and mother we know? how is it then that he saith, I came down from heaven? John 6:43 Yesu therefore answered and said unto them, Murmur not among yourselves. John 6:53 Then Yesu said unto them, Verily, verily, I say unto you, Except ye eat the flesh of the Son of man, and drink his blood, ye have no life in you. John 6:61 When Yesu knew in himself that his disciples murmured at it, he said unto them, Doth this offend you? Matthew 4:4 (cf. Luke 4:4) But he answered and said, It is written, Man shall not live by bread alone, but by every word that proceedeth out of the mouth of God. 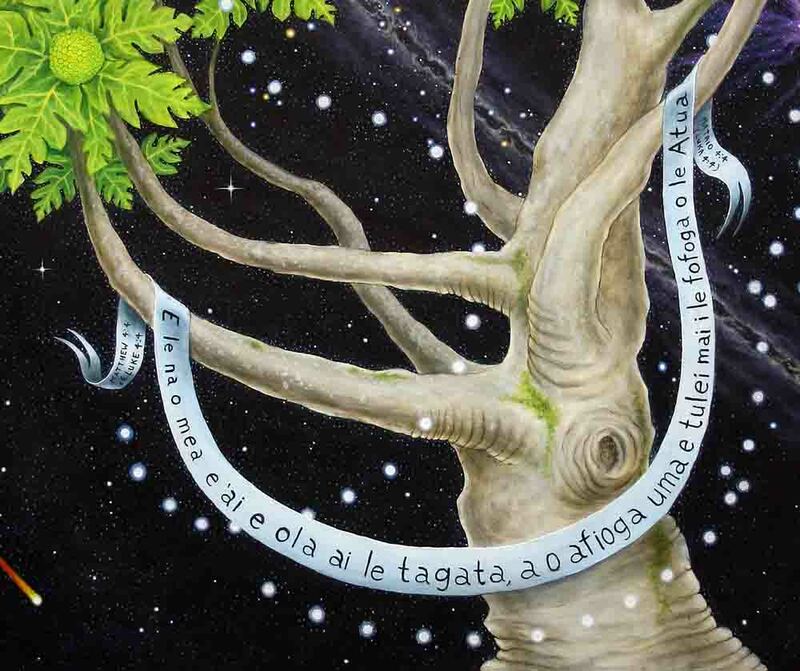 Details of Bread of Heaven (acrylic on canvas, 68-in high x 45-in wide) was painted in 2014, by Norbert H. Kox, at National University of Samoa on the Island of Upolu, during his two month Artist in Residency. It is a breadfruit tree in a heavenly setting. Breadfruit is a very important food staple in the Samoan Islands. 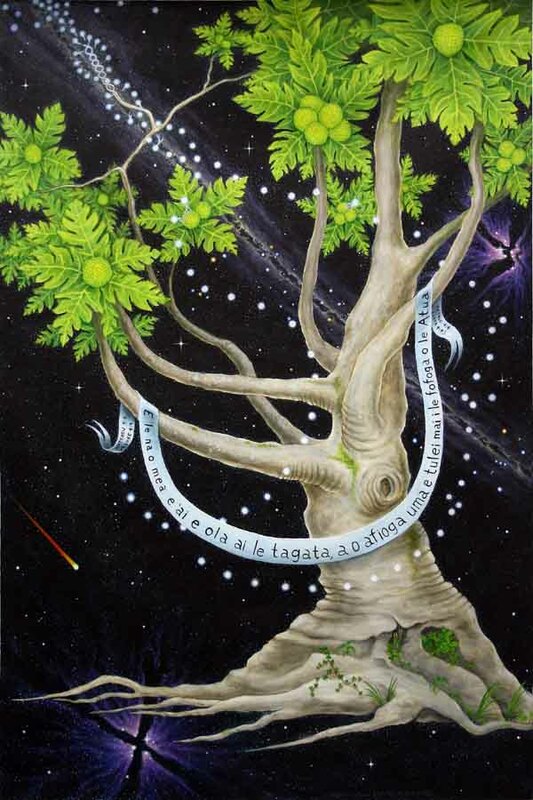 The banner draped over the tree limbs is imprinted with the scripture verse from Matthew 4:4, and Luke 4:4, "Man does not live by bread alone but by every word that proceeds from the mouth of God." It is written in the Samoan Language (thanks to my dear friend Lumaava). The spheres of energy coming down from above represent the light of God. 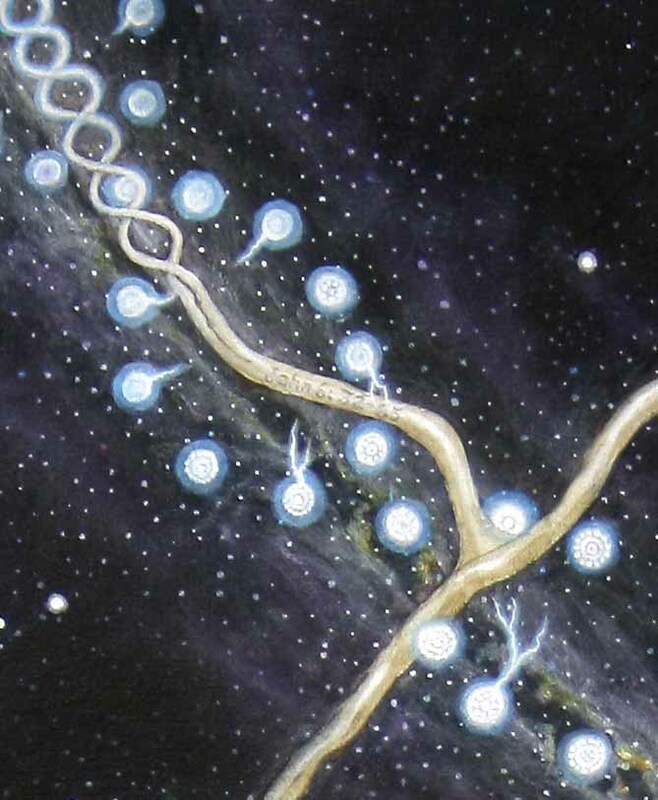 They are forming a DNA helix around the tree branch that is also in the form of a DNA helix, with the reference of Yesu Christ as the Bread of Heaven. This is to symbolically suggest that the heavenly eternal DNA of the Creator came to visit us in this physical realm with the promise that we could partake of that same eternal Life. 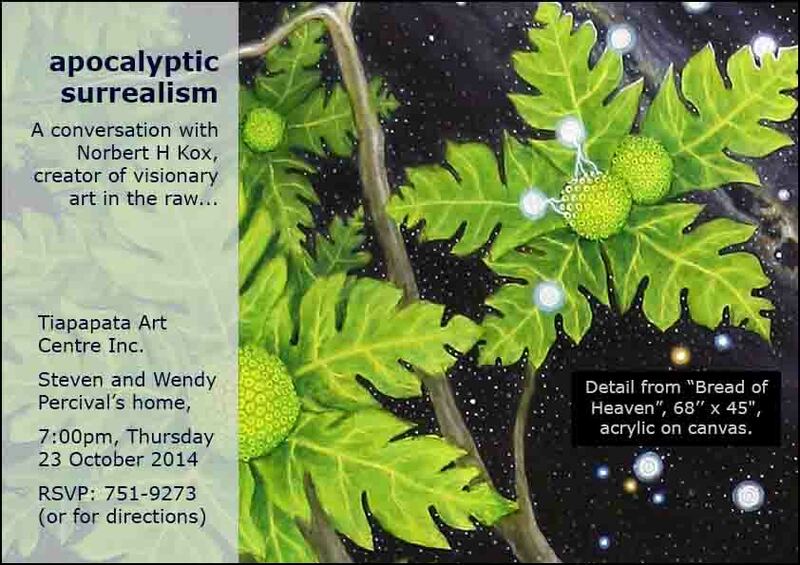 In the painting details we see the light or energy of God imparting life force into the breadfruit as tiny electrical lightning bolts. This symbolizes the electrical impulses that energize all life. The Milky Way streaks across the heavens in the background, along with the Southern Cross, the Diamond Cross, The False Cross and the Australian Triangle, as well as the constellation Orion. further down this page. Please scroll down.